The verdict on the federal budget for 2014 is in: Revenue jumped and spending barely grew. As a result, the deficit dropped like a stone. The deficit came in at $483 billion, or $197 billion less than last year, according to final numbers released by the Treasury Department on Wednesday. The government's fiscal year ended on September 30. The decline is dramatic: The deficit fell by roughly a third both in actual dollars and as a share of the economy. 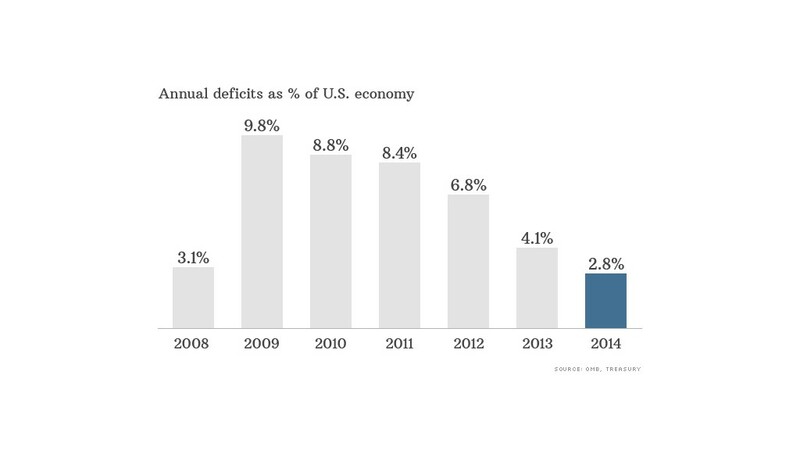 The deficit was 2.8% of gross domestic product, down from 4.1% in 2013. To put it another way: The deficit is now the lowest it has been since 2007 as a share of GDP and below the 40-year average. In dollar terms, the deficit is lower than it has been since 2008, the year the financial crisis took hold and started hitting the government's bottom line. The deficit reflects the gap between how much the government spends and how much it takes in over the year. Treasury borrows to make up the difference. The country's debt owed to the public, an accumulation of annual deficits, ended the year at $12.8 trillion or 74% of GDP, which is still very high by historical standards. Treasury reported that tax receipts in 2014 grew by $247 billion, or 9%, because of an improving economy as well as the expiration of some tax provisions and higher tax rates on high-income individuals. The economy not only bolstered tax receipts from wages and payroll taxes, it also boosted corporate profits and therefore business tax revenue. On the spending side, outlays grew by just $50 billion or 1%. A big reason for the modest growth in spending was the result of more dollars going to the government's biggest entitlement programs, such as Medicare, Medicaid and Social Security. But spending in many other areas of the budget fell. These included defense, homeland security, justice, unemployment benefits, and housing programs. 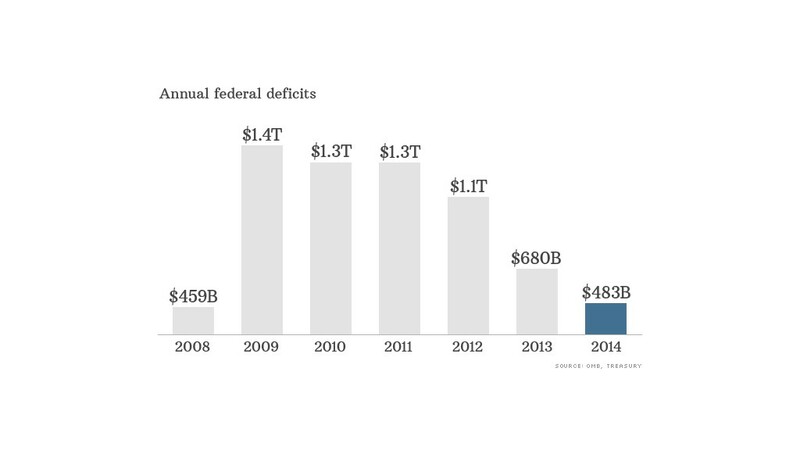 The drop in the 2014 deficit is the fifth consecutive annual decline. That trend has come as economic stimulus programs to counter the damage of the financial crisis dried up and Congress implemented broad spending cuts known as the sequester. It was also spurred by changes in tax rates for high-income households. There's likely to be a push to reduce the sequester, particularly in defense. But even if Congress keeps the spending curbs in place, the Congressional Budget Office has noted that deficits will start to move up again in a few years, and the country's accumulated debt will again start rising faster than the economy.